While not really "arctic" in the strictest sense, northern Finnmark comes pretty close. The eastern part of the Varanger Peninsula has average temperatures not reaching above 10 degrees in the hottest month, that is one much used definition of where the "arctic" line is drawn. In fact, a Polar Bear came on shore here some years ago! The barren terrain and shallow coastal area of the Varanger Fjord and the Varanger Peninsula certainly have arctic birds, in any case. The bulk of the Russian Stellers Eider population winter here, between 10.000 and 15.000 birds are present in winter and spring. Quite large numbers are present until May, and a few hundred can also be found in summer. 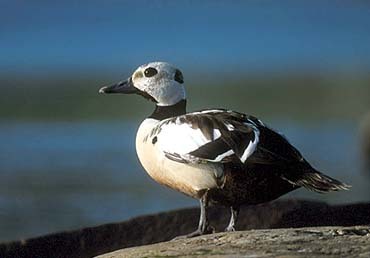 In between 3-5000 King Eiders also winter, and a few of these also summer. The arctic oceans are very productive, and feeds large numbers of breeding auks and other seabirds, particularly Kittiwakes. The auk colonies along the Varanger Peninsula have an extra inhabitant compared to those further south: The Brünnich's Guillemot. Never difficult to find, this species is a certain guarantee on any birding trip to Varanger. Usually these breed only in the high arctic, in Greenland, Svalbard and Franz Josef Land. Little Auk have been suspected of breeding, but never proven. In spring and autumn the migration to and from the arctic areas can be amazing. Where else can you see 300 White-billed divers in a good day? Or more than a thousand Pomarine Skuas? A large variety of shorebirds can be found resting on the shores on their way to and from their arctic breeding grounds, and auks, seabirds, Glaucous Gulls and four species of skuas can all be expected. There is always a good chance of finding more rare stragglers from up north, and Sabine's Gull and Grey Phalarope have been annual i recent years. A few sought-after passerines are more common here than most other places in Scandinavia, namely Red-throated Pipit and Arctic Redpoll. The short list of breeding passerines also include Shore Lark, Bluethroat, Lapland Bunting and Snow Bunting. What makes arctic birding so much more productive here than anywhere else is that in northern Finnmark, the arctic meets the boreal zone. That means a whole lot of extra good birds to seek for, in between the arctic jewels!